UBC presents the President’s Service Awards for Excellence and other staff awards annually, to recognize staff members who demonstrate outstanding achievement and excellence within the UBC community. The President’s Service Awards for Excellence (PSAE) were created in 1991 and is awarded to employees for their outstanding contributions to the university. With the growth of the university over the years, including the addition of the Okanagan campus, the UBC Vancouver President’s Staff Awards and the UBC Okanagan Staff Awards of Excellence were created to celebrate a wider range of accomplishments. 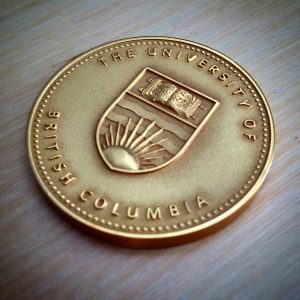 Although the staff awards are associated with campus locations, every UBC staff member is eligible for one award or the other based on their work location. For example, staff who are part of the Southern Medical Program are considered part of the Okanagan campus – and therefore eligible to be nominated for the UBC Okanagan Staff Awards of Excellence. Staff who work at remote sites such as the Malcolm Knapp Research Forest, the Dairy Education and Research Centre, Bamfield Marine Sciences Centre, Robson Square, and hospital sites in the Vancouver Fraser, Northern, and Island medical programs are considered part of the Vancouver campus – and therefore eligible to be nominated for the UBC Vancouver President’s Staff Awards. The deadline for 2019 nominations was March 15, 2019. Thank you to all nominators and supporters who have contributed nominations this year. We expect to announce the recipients of the President’s Service Awards for Excellence and the President’s Staff Awards this fall. If you have any questions, please contact us at workplace.recognition@ubc.ca. Up to five awards may be given in one year. Only individuals may be nominated for the PSAE. All staff of the University who have at least 10 continuous years of service are eligible for the awards, with the exception of Vice-Presidents, Associate Vice-Presidents or the equivalent. Each recipient receives a medal and $5,000. Awards are presented during Graduation ceremonies. The recipients will be selected by the President, with the support of an advisory committee. Up to 14 awards across seven categories may be awarded every year. Individuals may be nominated for all awards. Team awards may be submitted in the Enhancing the UBC Experience, Advancing Diversity and Inclusion, and Wellbeing categories. All permanent UBC Vancouver campus staff with a minimum of three years of continuous service are eligible. There can be up to 14 award recipients per year. A staff member can receive both the PSAE and the PSA, but not in the same year.